I legitimately can't imagine how I'd get through the day without my dogs. They're my alarm clocks, my personal trainers, my neighborhood watch, my therapists, and, of course, my best friends! If you're anything like me, then National Dog Day is just another day, because your furriest buddies are spoiled every day! Still, it never hurts to acknowledge that your pooch is the absolute best. So, I gathered up a few of the cutest pups I know to share a few great ways to spend National Dog Day with your best friend! Go for a special treat! My friend Willie enjoys a Puppy Latte from Starbucks. Follow Willie's Insta-antics at @lilwilliestyle! Savvy dog-owners know that a "puppy latte" is Starbucks-speak for a little cup of whipped cream, just for your dog! Here in Louisville, Three Dog Bakery and Barkstown Road have a fantastic assortment of cookies and treats! Lexington's Bluegrass Barkery is another favorite for fresh treats and customized food! Max and I took in some Shakespeare at Nashville's Centennial Park in 2007. My dogs love to tag along. It can be fun to take a well-behaved dog along on a road trip or an outing! Just remember to keep them cool and hydrated and give them plenty of exercise! Max loved Beale Street in Memphis! Make it a Yappy Hour! Coals Pizza in St Matthews hosts a Yappy Hour on their patio every Wednesday! Check with your favorite restaurant, cafe, or bar to see if patio seating is available for your pooch! Your canine companion would love to relax and catch up with friends, too! Book a Glamour Shots Session! Follow the littlest of these babies -- Lola "Tiny" -- on Facebook. My BFF took her fur babies for a set of portraits at Jeannie Francis Photography. What a unique and wonderful way to commemorate your furry friends! Take them for their favorite activity! Max in 2016. Still chasing the tennis ball. My Max is a classic retriever. He has been obsessed with playing with tennis balls for hours on end for 9 years now. It's always his favorite thing to do!! 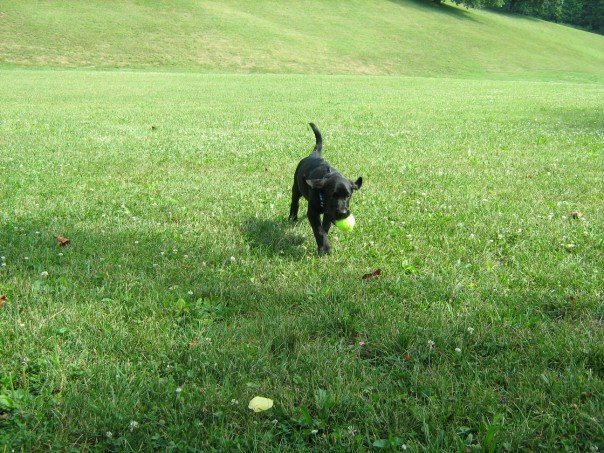 Sophie, my lab-terrier mix, loves to walk and explore! She loves a trip around our neighborhood, while several of my friends take their pups to one of Louisville's amazing parks! Several of my friends have dogs who love to hang out on boats! Skylar loves Cave Run Lake! Chico enjoys the Ohio River. Follow Chico on the 'Gram. Whatever you choose to do with your furry friend, make sure that he or she knows how much you appreciate the unconditional love! How are y'all celebrating National Dog Day?